Home 90 years of HoMA archives are now available online! 90 years of HoMA archives are now available online! 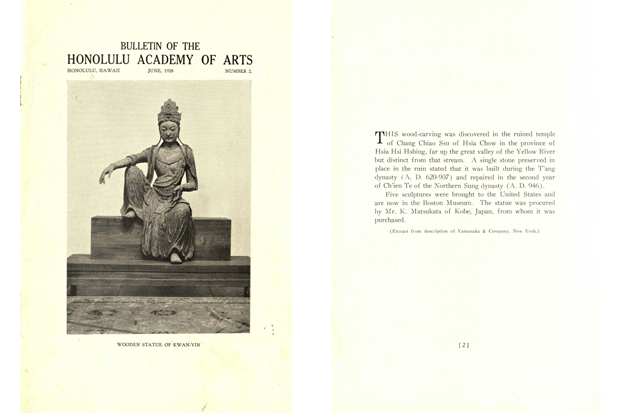 This and 650 other issues of the museum’s member publication, dating from 1928 to 2017, are now online and searchable via UH’s eVols digital repository. With the exception of five years during the 1950s during which it was strictly a calendar, the publication presents research on collections, interviews with artists, and articles about exhibitions and programs—many of which are written by museum curators and guest curators. This digitization project, a partnership between the HoMA Archives and the University of Hawai‘i, was supported in part by a grant from the Hawai‘i Council for the Humanities. For me, one of the most interesting things about the collection is its 90-year scope and the opportunity it provides to observe the changing world through the lens of art: whereas early 1940s bulletins are concerned with the role of art and artists in times of war, later issues document artists and curators exploring questions around culture, land, displacement, and the built environment. I also noted with some amusement—and nostalgia—the changes in language over the years: “travel along the Electronic Superhighway to Cybertown,” reads the description of an Academy/KCC “mini-course” in contemporary art (the course concluded with a discussion of the work of Nam June Paik). 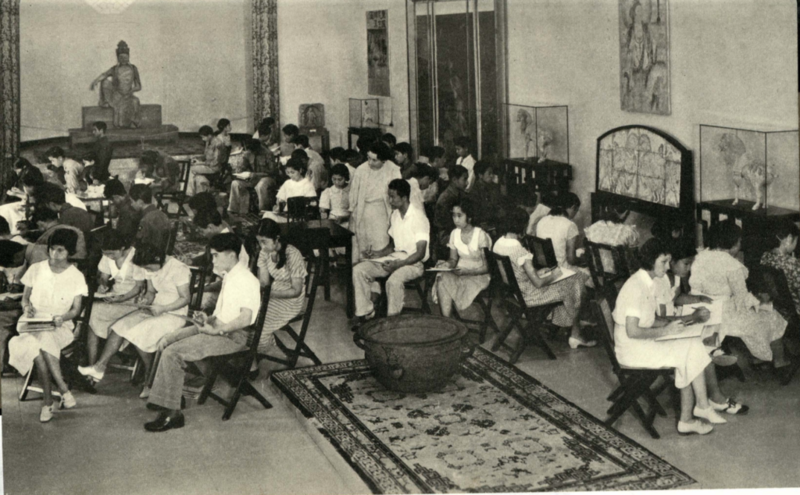 Students in the galleries from a Sept. 1938 Educational Bulletin. What remains constant, though, is the steady flow of students going through the museum and art school. Mahalo to HCH, to our partners at UH, and to former art school registrar and archives volunteer Kelsey Karsin for helping us to make this collection more widely accessible.